Chapter 5: "Herald of the Ivory Labyrinth"
The cult of Baphomet has been delivered a critical blow, yet the demon lord remains undeterred. Now he’s taken hostage the herald of Iomedae, goddess of justice and valor. The heroes of the Fifth Crusade must attempt their most dangerous and audacious mission yet—travel to Baphomet’s Abyssal realm known as the Ivory Labyrinth, navigate its trackless mazes, and find the ancient prison in which he’s keeping the abducted herald. Can the heroes rescue the goddess’s messenger, or are they already too late? And was the abduction merely a ruse by the demon lord to lure the heroes into his clutches? 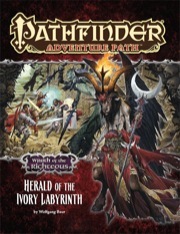 "Herald of the Ivory Labyrinth,” a Pathfinder RPG adventure for 15th-level characters with 7 mythic tiers, by Wolfgang Baur. A look into Baphomet—demon lord of beasts, labyrinths, and minotaurs—and the workings of his sinister cults, by Sean K Reynolds. An exploration of the foul fiends known as demodands and their place in the Abyss, by Amanda Hamon. Betrayal and bloodshed in the Pathfinder’s Journal, by Robin D. Laws. Four new monsters, by Amanda Hamon, James Jacobs, Ron Lundeen, and Jason Nelson. The story of this leg of the AP is fantastic -- the players have to head to Baphomet's Ivory Labyrinth and break into a prison in which he keeps his most dangerous foes. More than any other AP, this AP feels epic and "heavy metal", and the flavor of this leg of the AP is awesome. Unfortunately, the difficulty level of this AP feels way off. The encounters in this leg of the AP are trivial for mythic PCs. Heck, most of the encounters of this AP would be too easy for non-mythic PCs. Given the awesome story of this leg of the AP, this was disappointing. Although Herald of the Ivory Labyrinth diverges the PCs from their main quest for a little while, it is still a highly exciting adventure with a scary setting, high rewards, and a truly thrilling conclusion. Our PCs were honored to have one of their Gods actually appear to them and personally ask for their aid. It’s not very often that characters come face to face with a deity, so Iomedae’s appearance was an unexpected treat. The magic items she lent the players to help them on their quest were very interesting artifacts as well. I’m not quite sure why she felt the need to give us a history exam first, but it’s not my place to question the Gods. The Ivory Labyrinth was a weird setting and felt like more of a sandbox than I would have liked, but I was glad for the fun encounters of weird monsters and unexpected allies waiting within. I especially liked the opportunity to resurrect Malakia, the unfortunate Astral Deva. I also appreciated that PCs are given a chance to save the fallen Herald of Iomedae. Simply killing him when his fall from grace wasn’t his own fault would have been too sad. Redemption is a big part of this adventure path, and our group liked to help others wherever they could. The battle with Baphomet was an incredible event, a feat that only mythic characters would have been able to manage. Actually slaying a demon lord isn’t something players get to do every day. Needless to say, we all had great fun with that. There are a lot of nice little things to mention about Herald of the Ivory Labyrinth as well; the art continues to be fantastic. The portraits of Ylleshka, Svendack and the Bonepowder Ghoul are quite worthy of note. Dawnflower’s Kiss was a wonderful gift. Our cleric, who had the Touched By Divinity trait (with Sarenrae as her parent) was overjoyed to wield that weapon! Herald of the Ivory Labyrinth, written by Wolfgang Baur, manages to be one of the most original and exciting outer plane adventures I’ve read in some time. While The Midnight Isles, its immediate predecessor in Wrath of the Righteous, is rather ordinary as far as planar adventures go, Herald brings back the mythic feel that was present in the earlier instalments of the adventure path. This is an adventure where the PCs face off against some of the deadliest foes in the multiverse, but also leaves ample room for investigating, roleplaying, and drama. And it brings with it some incredible rewards for the PCs—assuming they succeed, of course. In "Herald of the Ivory Labyrinth", the PCs are caught in what my be one of the biggest stories ever told in an AP - the demon lord Baphomet lured Iomedae's herald into a trap, kidnapped him and corrupted him, and is no holding him prisoner. Iomedae herself addresses the PCs and requests that they help free her herald. As an individual adventure, this is really, really cool. And the adventure is written in a way that capitalizes on the kind of high level adventuring it requires. We get an excellent description of Bephomet's realm, and the long dungeon crawl the adventure culminates in, The Ineluctable Prison, is the coolest yet in the AP. There's something awesome about seeing all those CR20 or more encounters, and I imagine playing through them will feel appropriately mythic. Having said all those good things and given the adventure the high 5 starts rating it deserves, I do have a caveat or three. Firstly, as was hotly debated in the product description forum, I feel the section of the adventure that handles talking with Iomedae was a major spoof. Another small issue that I have is that the story doesn't really make sense - Baphomet is insanely angry at the PCs, but fears to confront them because of his vulnerable state - however, he knows full well that the PCs will be trying to free the herald from his Ineluctable Prison. Yet for some reason, instead of summoning a screaming horde of a million fiends to defend it for him, he... does nothing? seriously, he is inactive during the entire adventure, even though it is said many times that he is angry and looking for a way to get revenge at the PCs for all the trouble they caused him. The greatest issue I have with this adventure is that it feels like the side quest - the main story of the campaign is forgotten and pushed to the background, and the PCs run off to do a mission that, while certainly accomplishes something great and important, also has nothing to do with the larger plot of the campaign. After the 3rd adventure, that was just a huge waste of time, and the fourth adventure, that also put the PCs far away from the action, I feel that a large oppertunity to play up the crusade aspect of the story was missed. Hopefully the last adventure will compensate for that, but for now it kind of feels like the PCs are away from the action running errands for most of the campaign. Compare to, say, Curse of the Crimson Thrones, where the PCs carry the torch of the plot from the second adventure all the way to the 6th, and what they are doing is always the crucial, necessary next step. That was a much better constructed story, in my opinion. But, still, despite some problems that I have with the structure of the campaign as a whole, Herald of the Ivory Labyrinth is one of the coolest adventures Iv'e seen in a long while, and it makes me hope that the next one would be even more awesome. Announced! Image is a mockup and will change prior to publication. This Adventure looks more amazing with every announcement! 15th level plus 7 mythic tiers. I wonder if they will make it to 20th level by the end of the next book. Getting to 20th level before finishing the last book is kind of one of the main goals of Wrath of the Righteous, in fact! This was so much fun to design, and let me deliver so many demonic nightmare-encounters, that I just couldn't possibly say no! I did not sleep much, just stayed up late or early and wrote like mad. Then rewrote it. Then opened the cage in James Jacobs' general direction. I think my map turnover was a couple weeks late, but James forgave me. The urge to cackle madly strikes every time I think about the opening and the finale, and one really crucial sticky bit in the middle. Yeah, between that, his own company, RPG Superstar judging, and the thing he's doing for us that's getting announced at PaizoCon—you know, that really major thing that nobody even knows about yet—he's got to be one of the hardest working people in the game industry. Wolfgang, this looks like it's right up your alley. Can't wait to see what you do, and how James' twisted little mind tweaks it. This is why you really should start showing up at PaizoCon, Marc. The Saturday banquet is packed with Major Announcements. So. 15th level plus 7 mythic tiers.. these PCs are as strong as 22nd level characters with that, yes? I think it comes out to around 18th/19th, from what I recall of where the playtest ended, but it might be that high, too. Ah I only have the early playtest stuff, and that one says you add the mythic tiers to their level to get the general power level of a PC. Still, this campaign is gonna be awesome! Who is going to write the last module? I keep my fingers crossed for Brandon (who is just knocking out one epic module after the next lately). So in this book the PCs are going to be more powerful than in any previous AP book, ever, including the final moments of all previous APs. Right? Dibs on Planar Hardcover by Wolfgang, Ray, Colin, Erik, James, Todd and Monte. Happy to see Wolfgang back in the mix! I bet that his experience writing the Savage Tide adventure "Enemies of my Enemy" for 19th level characters and featuring many demon lords including Orcus himself came in handy in writing this particular adventure. Definitely at the end of the module. At the start... hmm, I'd say the guys from Rise of the Runelords ( which ends at lvl 18, IIRC ) have a chance to be as strong. Same with the ones from Shattered Star. Consarn it! Everything I hear about this makes me want to play it more, but I don't think I'll ever get the chance because it doesn't seem like the sort of thing my group would go for. Grrr. Oh well, at least there's some demodand love at last! Huzzah! Man, I'm really excited for this. One of my favorite demon lords, one of y favorite authors, and the penultimate AP chapter. The stars are aligning! Sounds cool! The adventure theme is almost shocking in its simplicity. I think the community is ready for some classic themes again. Hm... Another repeat of Arazni, perhaps? Just curious, assuming that Baphomet is the demon lord presented in this issue (I think that's pretty safe), how different is he going to be from the version that you wrote in Dragon 341, James? Quite different. We're going a lot more with the traditional mythological appearance of Baphomet for Pathifnder. While he'll still have some sway over minotaurs, we're really downplaying his role as the god of minotaurs and uplaying his role as a lord of mazes and beasts and secret cults. He'll look more like the real-world mythological depictions of Baphomet and will have different powers and abilities than the version I statted up in Dragon magazine... but since BOTH of them are inspired by the same mythological sources, there will also be some similarities. So, oracular brazen heads and... oh hey, you did mention a knightly order that's dedicated to him (secretly, I'm guessing)? So is the secret out yet? I believe Wolfgang is working on the Strategy Guide. And he'sgoing to write the next three AP solo! Although that might be an exageration. Now when are details about part 6 of this AP released? Is that Old Alain on the Mockup? I don't recognize it or the backup image. Both pieces are from the Mendev section in the Inner Sea World Guide. The dude is a Mendevian Crusader. Where is part six o.0 ? not up yet. Parts are put up as their shipping date nears, generally 4 or so months away. Richard Pett's City of Locusts is volume 6. "Doomed" is something they wish they were once Sir Pett is done with them. I'm doing the art order for this now. Lord Stillborn is one of my favorite bad guy names, but this guy's probably the LEAST freaky thing I get to order art for today. WOOO! Ahem. I mean, MNARRRR! You know your doing right when a baddie named Lord Stillborn isn't the freakiest art in the order. Though now I wonder who/what he is that warrented such a comment from JJ. Was he from his mother's womb untimely ripped? Not only can I not wait to see what an evil genius like Wolfgang will do with this, but I must also add that city of locusts is the most exciting, awesome, epic outline I've ever seen from those lovely paizo folks. It had me bouncing with terrible evil glee. I have to say, this was a project where I had to ask myself "Can I really DO that to the players? What have I become?" As in, more than once. It's vile. It's full of horrors. It's a mere appetizer for the city of locusts, but really, I think Pathfinder needs some one-off Sanity rules for this whole AP.